Jenn and Romy: Jenn Graduated! Today was my graduation ceremony for finishing my Master's degree in Mechanical Engineering from the college of engineering at UC Berkeley. It took me two years - the first 3 semesters I took classes, and the last semester I did a lot of research towards my master's project (but I was still taking some extra classes as well). The ceremony was outside in the Greek Theater, which is like an amphitheater. The ceremony started at 8:30am while it was still foggy out, and there was a cold wind. 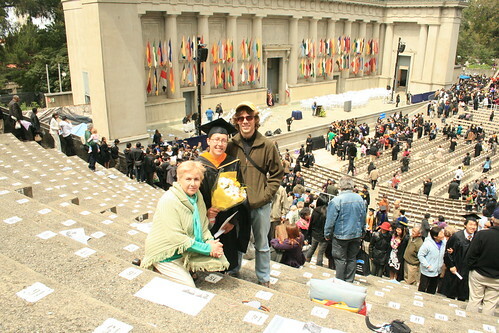 I wore a lot of layers underneath my graduation gown so I could stay warm, but I was still a little chilly. And my gown had a hood, but I couldn't wear it of course, it was just decoration. After what felt like forever, with all of the speakers, I finally got my chance to walk across the stage! My mom and dad and Romy were in the audience. My mom flew in and my dad took the California Zephyr Amtrak train. Yay - I am officially done with my master's degree!